Car enthusiasts generally don’t mind learning about the history of their favorites rides, but with attention spans growing shorter by the minute, a five-minute crash course on 50-odd years of automotive development is just the kind of break we need to get through the workday. To make that happen, the folks at Cars Evolution on YouTube have put together some nifty videos chronicling the evolution of three iconic American nameplates – the Chevrolet Corvette, Dodge Challenger, and Ford Mustang. Watch all three videos below. Having been in production since 1953, the Corvette certainly has all kinds of history to cover. Only 300 were built that first year, which the video correctly mentions were all finished in Polo White. As the video morphs through the years, we’re happy to see rarities like the 1963 Grand Sport in there, though the Mako Shark II concept doesn’t really fit the theme of production car evolution to us. We also caught an error with the 1968 Corvette being listed as a C2 model, when it was actually the first year for the C3. But it’s still fascinating to see the different Corvette body styles through the years. This video was posted in August, almost two months after the Corvette clip and the “morphing” between the years is much improved. Unfortunately, the Challenger doesn’t actually have that much design history to morph between compared to the other cars in the series. People tend to forget it was actually a late bloomer for the original muscle car era, having launched in 1970 only to be killed four years later without a significant redesign. A brief return in 1978 as a rebadged Mitsubishi Galant Lambda is generally considered a black mark on the nameplate’s history, and then we jump to the proper revival in 2008 – a body style which has since endured virtually unchanged for nearly 10 years. Fortunately, it’s a design that we never get tired of looking at. 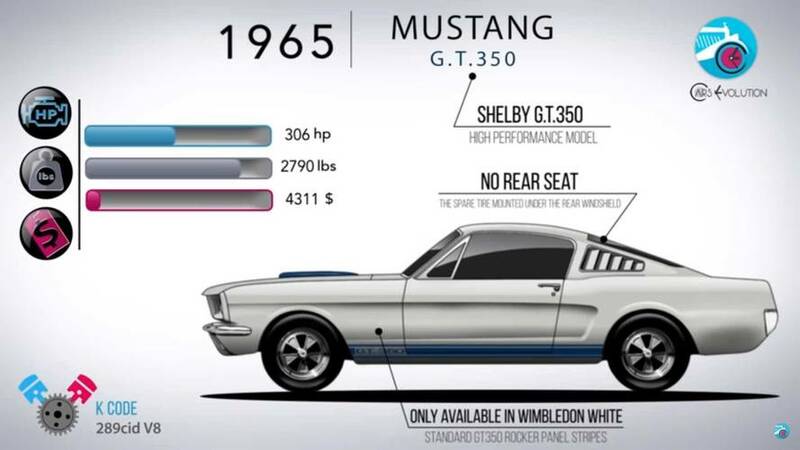 Posted just a week ago, the newest video takes a comprehensive look at the Pony car by focusing on the eras people tend to remember best – the first-generation cars in the 1960s and the fifth-generation cars that launched in 2005. That’s not to say the Mustangs in the middle weren’t memorable – the Mustang II from 1974-1978 remains one of the best-selling generations in the nameplate's history despite a near universal hatred for the car. And we were very happy to see the often-overlooked 1984 Mustang SVO get a shout out. The history lesson wraps up with a smorgasbord of late model cars, including the 2016 Shelby GT350R with a sound clip that reminds us just how great the flat plane crank V8 sounds. Hopefully a Chevrolet Camaro evolution video is coming soon. In the meantime, tell us what other cars you’d like to see summed up in a five-minute history lesson.